In this day and age of constant pollution, air quality is a concern we all share. Every day, we are exposed to all types of hazardous material. It doesn’t make sense to buy a comforter that produces down dust. A traditional down comforter can deteriorate over time, especially during extended use. This means the fill can begin to break down. This breakdown comes in the form of air born dust particles. These can build up and become hazardous to you if inhaled over long periods of time. It can also cause fill clumping because the broken down powder usually ends up in the corners of your comforter. That means you can end up with a splotchy, clumpy comforter. You can avoid all of this headache by choosing a down alternative comforter. This is a smart choice for anyone concerned about their air purity. It is highly recommended for people who live in highly polluted cities where the air purity level is already lowered because of smog. A down alternative can be the right sleeping solution for you. The Linenspa White Goose Down Alternative Comforter has the heating capabilities of a traditional down comforter without the added dust. This is because of the specially designed microfiber fill. It’s good for all seasons which means you will stay comfy all year-round. The microfiber fill looks and feels just like goose down and its 100% hypoallergenic. It’s a thick and cozy comforter that will cuddle you to sleep. This luxurious quilt provides excellent heat distribution and the box stitching keeps the microfiber in place. Box stitching is very important because it creates individual pockets for your fill to sit in. These smaller pockets keep your fill in place. Other stitching techniques don’t measure up. They can leave you with uneven fill, and they show wear and tear very easily. A great looking comforter makes a room feel cozier. The stylish design of this comforter will accent your bedroom decor perfectly. No bedroom is complete until you add the comforter. The incredibly soft microfiber outer shell is plush to the touch. It allows your body to breath in any environment. This regulates your overall temperature and it can help you fall asleep quicker. This comfy quilt can keep you happy year around. The Linenspa Down Alternative Comforter is specially designed with ultra-lightweight materials. You will love how fluffy and soft this comforter is. It only weighs 5.1lbs. No need to sacrifice your healthy for your comfort. The advanced microfiber fill produces all the comfort of down without any of the allergens. Linenspa designed this quilt to be health conscience and it shows in its innovative design. A clean comforter can last years longer than one that has not been maintained. You should clean your comforter on a regularly scheduled basis. This product is machine washable. You can wash this comforter with your washer set to gentle and cold water. 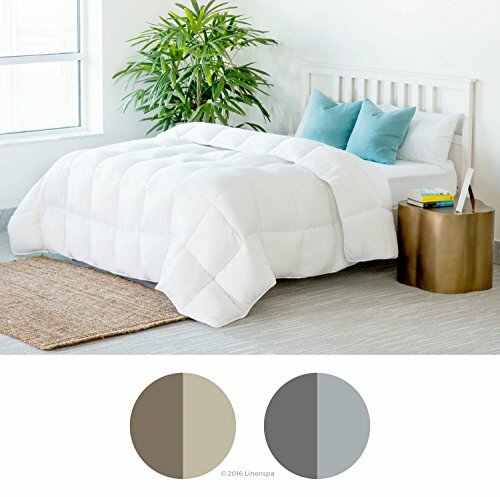 You will be the envy of your friends and family thanks to the crisp styling used on this comforter. It is contemporary and welcoming. Your bedroom has never looked this luxurious. A microfiber fill accomplishes the task of traditional down feathers. 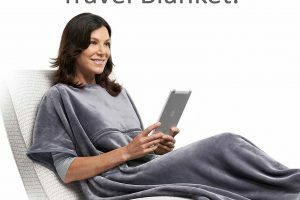 It keeps you warm and cozy all night long. You will sleep better and you will feel better. Medical professional all over the world have proclaimed the benefits of a healthy sleep cycle. This comforter is 100% machine washable. A stylish stitching provides an elegant appeal to your decor. The lightweight microfiber keeps you toasty year around. This unit only comes in 3 sizes. Tthe Queen size is a little smaller than anticipated. 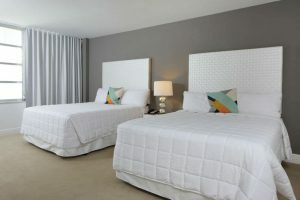 The Linenspa White Goose Down Alternative Comforter stands out in the crowd. This product is very well built for its cost. It is lighter than most synthetic down comforters on the market. The microfiber feels very soft to the touch. It has a very nice loft to it. This comforter is definitely a cozy selection. 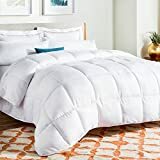 The Linenspa White Goose Down Alternative Comforter is an excellent buy for anyone looking to upgrade their current comforter. This plush duvet is the perfect way to end a hectic day. You can machine wash this product and save yourself on dry cleaning. The microfiber feels just like traditional down feathers , but it is just a fraction of the cost. If you want to fall asleep faster, this comforter is a great choice for you. 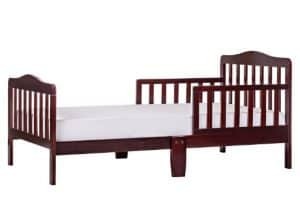 It is more durable than most comforters of this price range thanks to the high-quality materials used. It is very well built, and will last several years. You will be more than satisfied with your new Linenspa White Goose Down Alternative Comforter.